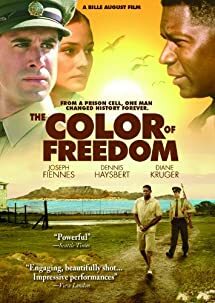 Posted on December 22, 2013 by Warin	in Dennis Haysbert, Jennifer Hudson, Mandel and de Klerk, Morgan Freeman, Nelson Mandela, Sidney Poitier, Terrence Howard, the color of freedom. On December 5th, the world said goodbye to Nelson Mandela, one of the truly great leaders of the 20th century. The freedom fighter who fought tirelessly against a racist government regime, only to be imprisoned for 27 years on a barren island, and to be elected president just four years after being released, is the stuff of fairy tales — but all of it incredibly true. Not only was Mandela’s journey the stuff of legends, but it made for good theater as well. So it should come as no surprise that Nelson Mandela’s rise from prisoner to president has been adopted numerous times on the big screen and Mandela himself portrayed by a variety of actors. Here’s a list of a few of them starting with the most recent.